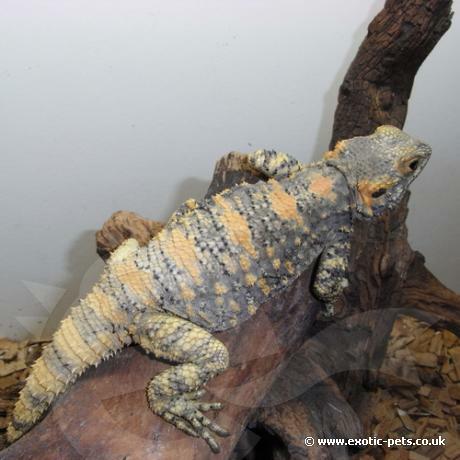 The Painted Dragon has a similar appearance to the well known Bearded Dragon, they even tame down in a short period of time making them a good species to own. What do Painted Dragon look like? Having an appearance like the common Bearded Dragon, they have the same shape, build and temperament. The body is covered in small rough spiky scales. They have an overall grey coloured body with diamond and lateral stripes and blotches that are a pale creamy yellow to rich orange. The tail is mainly yellow to orange with grey bands. During the breeding season, males have a black throat, females have a pale throat. They reach an adult size of 30cm snout to tip of tail, approximately 15cm is snout to vent. Where are Painted Dragons from? Painted Dragons originate from Southern Israel, Southern Jordan, Northern Saudi Arabia, Sinai and Egypt. They are from desert areas and can be found close to human villages. How do you keep a Painted Dragon? Keep Painted Dragons in a large enclosure of at least 48x24x24inch for either a sexed pair or trio, they require plenty of space as they are an active lizard. Provide a desert set up with a sand substrate with rocks, caves and climbing areas. The ambient air temperature needs to reach 22-25C (71-77F) with a basking area of 35C (95F), this can reach up to 40C (104F) in the wild. These temperatures can be maintained with the use of ceramic heater, basking spot lights, or a mercury UVB bulb, all but the latter should be connected to a thermostat to prevent over heating. The use of a heat mat or heat rock can be used to help maintain a warm spot in the enclosure. Place a protective guard over any bulbs to prevent your Agama burning its body. During winter provide a cooler temperature of between 10-15C (50-59F), this species must be placed in a hibernation state if you want to try breeding for a minimum of 5-6 weeks. It is important that Painted Dragons receive the correct UVB lighting, there are two options available. The first is to use a 10% UVB strip light and the second is a mercury vapour UVB lamp, the use of a low wattage vapour bulb will prevent over heating. Provide a small water bowl at all times, however this species prefers to be lightly misted in the mornings, they will drink the droplets of water from the décor. Feed on a range of insects such as crickets, locusts, mealworms, wax worms and roaches. Youngsters need to be fed daily whereas adults can be fed every two days. Place a vitamin dust on the insect food before feeding to your Painted Dragon to ensure that it receives all the vitamins and minerals it require to stay healthy. Most will also take small amounts of plant matter like dandelion flowers and curly kale.